This project originally appeared in the July Gauche Alchemy Newsletter. I’ve been writing as part of the Gauche team of Alchemists for 3 months now and am constantly floored by the amount of creativity in the projects I get to write up every week. If you’re ever at a loss for inspiration or want a creative shot in the arm, the Gauche Alchemy blog and newsletter is a sure-fired way to get it! For Mother’s Day, this year, I found a book full of pretty pictures of dressed-up French Bulldogs that I knew she’d get a kick out of. Wrapping a book is kind of boring, though, so I thought I’d use a package of yellow tissue paper I found in the hall closetÂ (heaven only knows when I bought it, but Mom’s favorite color is yellow, so, score!). Of course I couldn’t find the tape. Whatever I did with it the last time I used it, I definitely didn’t put it back in my dry adhesives drawer. BUT! I could easily locate my new stash of Washi Tape from Gauche Alchemy and there was a pretty green and yellow floral tape that would match perfectly. What is washi tape? It’s patterned masking tape, sometimes also called paper tape, that is very fun to work with. I just like using it in place of plain tape for various things around the house (makes the mundane more fun) but it’s great for scrapbooking and general craft purposes, too. Or, as Mom put it, it’s makes you look even more artsy-fartsy than you are. Anyway, I started out thinking I was just going to wrap it like any other present, but then I started to play, and this is what I ended up with. I realize the point of using a gift bag is to make wrapping easier, and that making your own bag out of the tissue paper that’s usually stuffed inside as filler defeats the purpose, but I promise this is really quick and simple while creating major impact. Since I wasn’t planning on this being anything of consequence when I started, I didn’t take step-by-step pictures. Instead, Â I drew you some pictures to explain how i made it. 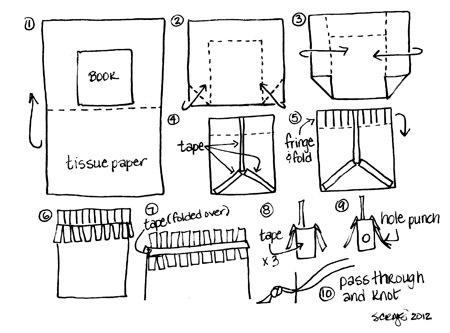 Start by spreading your tissue paper out and placing the book on one side (figure 1) and folding the other side up to cover it. In order to obscure the book title I had to use all 5 sheets of tissue paper–this was a good idea considering the end result. Then fold up the bottom corners (figure 2) and and the sides into the center (figure3), taping each seam with the washi tape (figure 4). Fringe the extra paper at the top of the package (figure 5, this was the point when it started resembling a bag, to me) and fold down the outer layers of the fringe (figure 6). Because of the folding there were, essentially, 3 layers of tissue fringe at the top of the package, so folding the outer layers of the front and back left a center section that resembled the tissue fringe usually poking out of traditional gift bags. To keep the folded layers of tissue down, I added a length of washi tape, folded over, along the top edge (figure 7). The only thing left was to add a handle! Since we’re dealing with tissue paper, here, I thought it would be a good idea to reinforce the ends of the “bag” with 3 layers of washi tape folded over the top edge (so 6 layers of tape, total, figure 8), punch a hole in each side (figure 9), and thread some wide ribbon through each hole and double knot it on the outside of the bag. I wouldn’t say it would hold up to a lot of weight, but it did it’s job admirable. After the bag was made I decided it needed a little dressing up. For the front I kept it simple, just making a square of the tape to frame in the shape. On the back, where the functional taping was, I filled in the “starburst”-style pattern that the first 3 lines suggested, then framed it in with more tape. The end result was a little more like a quilt square. Of course, when we got to dinner and Mom tried to remove the book without destroying the bag, we discovered it’s a good idea to leave a little wiggle-wiggle-wiggle room when folding the sides (figures 2 & 3). I eventually got the book out without tearing the wrapping, but a little forethought would have made it easier. You craft and you learn, right? Have a great 4th! I love your bag! I’m so impressed! What a beautifully done project. I was really wowed when I read further in to the tutorial and learned that entire project, even the bag, were made from scratch. The bag looks so professional that I was certain that you had started with something store bought. Awesome!